Our members have been using our software for over 6 hunting seasons! * Convenience and Savings - You can sign in to your stand before leaving home or from hunt camp before you even get in the truck! Not only is VSIB convenient, but it will save you time and gas because you won't have to keep driving to a central location to sign in and out. Time driving, and the gas expense to get to and from your physical sign in board is eliminated, saving you and your club valuable time and money. One weekend driving to and from the sign in board is more expensive than signing up for VSIB; especially, if you're hunting multiple land parcels that are spread out over several miles. Don't let driving to the sign in board be a chore any longer! So, if you're ready to save Time, and Cash on gas, then VSIB is a great investment for your club! * Communication - Every club with a physical sign in board has an occasional problem with people who don't want to go sign in either because they were running late, or it's too far to drive. If you are like me, you hate arriving at a stand location to find out someone else is already there. The other members will know where you are too, so they will know not to mess you up by coming to your stand on accident. 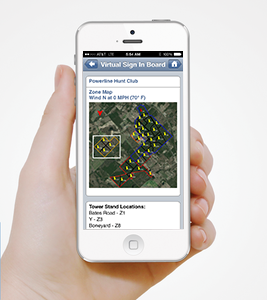 With VSIB, signing in, and seeing where others are hunting is at the touch of your fingers! You can also run reports to see what locations have been hunted the most. * Safety - Safety is built into VSIB. VSIB does something no physical sign in board can do. It knows when a hunter did not sign out, and it sends out a safety alert! Every member of your club can see where members are hunting, so if any kind of problems occur, then the other members immediately know where to go to help. At 9:30 p.m. every night, VSIB checks to make sure all hunters have signed off. If a member did not sign off, then the safety alert is sent via a text message alerting that member, and the people in charge, allowing them to check up on the member who did not sign out. A new safety system for this upcoming season has been introduced that allows a member to send an emergency text with their GPS location on a Google map with a single click of a button. This location is sent to the people in charge of the sign in board plus one emergency contact that the distressed member has previously designated. 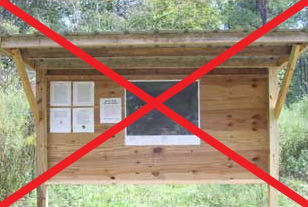 VSIB helps your club keep its members safe by including safety systems! Contact us if you have any questions at support@virtualsigninboard.com.